Yet again, this year I returned to the rocky island of Pag to do the same job as in the last years. I was quite excited to come back to celebrate my two year serpent dream anniversary and one incredible year of invincibility. Before my trip I started doing a bit of research about the antiquity of Pag with the intention of finding some kind of mythological or historical thread to pull on in order to tip my hat to an older spirit of place in the course of ritually celebrating my magical birthday. Well, I had barely touched the first thread I could find and a whole spaghetti bowl of delicious mess of myth and enchantment landed in my lap! I found out that in pre-Roman times the island of Pag was inhabited by a tribe of the Illyrian people called "Liburnians" that lived along the Adriatic sea and was well known for their seafaring skills. Not much is known about their pantheon, mostly because it consisted mainly of very regional deities with changing names, almost all of them female! The only mention of names of their deities are from Roman Empire period monuments, some with interpretatio Romana. 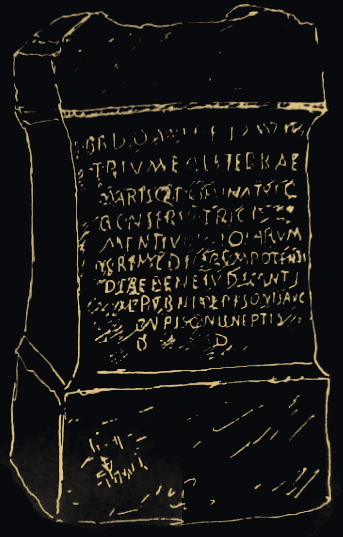 A fully preserved sacrificial altar dedicated to a Liburnian deity was actually found on the island, erected by the Roman noblewoman Calpurnia in honor of the local goddess Heia syncretized with the Roman goddess Bona Dea! I couldn't believe this series of synchronicities with my own serpentine obsession and my quite fresh connection to The Mother Goddess, all tying in with the place where all of this started! It might be connected to having just finished another novena to Our Lady of Candelaria ending on her feast day a week before...it felt like I was being directed to something. Anyways, excited about all my findings I travelled to Pag - mainly for my job - but now I even ended up with a mission for my magical anniversary: to acknowledge and to thank the local goddess Heia and the spirits of this place. In the last years I always had rented a scooter to explore the island but this time my work schedule was tighter so I didn't find the time to do that and the range of accessible places to do a ritual was quite limited. I remembered an old ruin near the villge of Caska reachable by foot in under an hour. Coincidentally the same village is also the location of most of the findings of Roman architecture and objects. 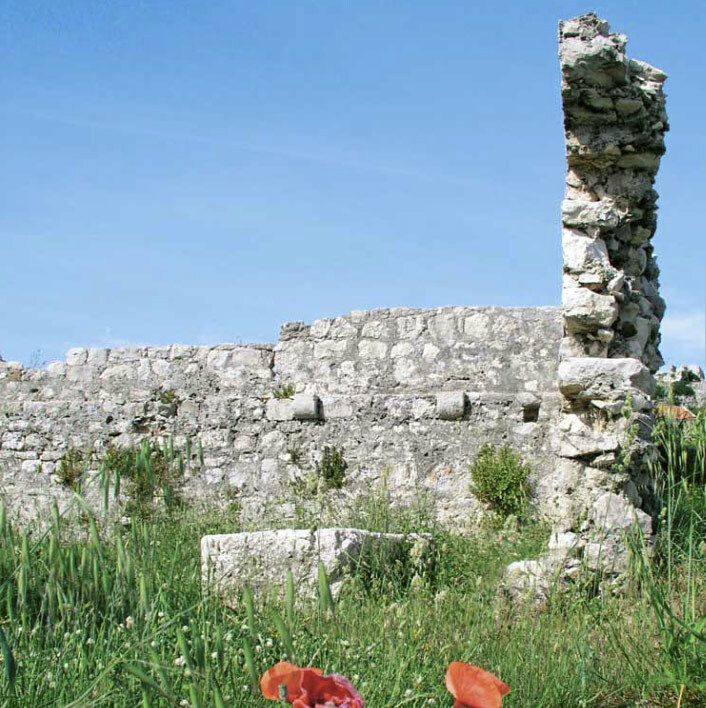 Back in the days, the island of Pag was called Cissa or Gissa after this exact Roman settlement of the same name. Caska itself is a very tiny village and is mainly consisting of tourist apartment houses along a road to the town of Metajna. According to the tourist brochure (4) several Roman artefacts were discovered there as well as a necropolis next to the sea. 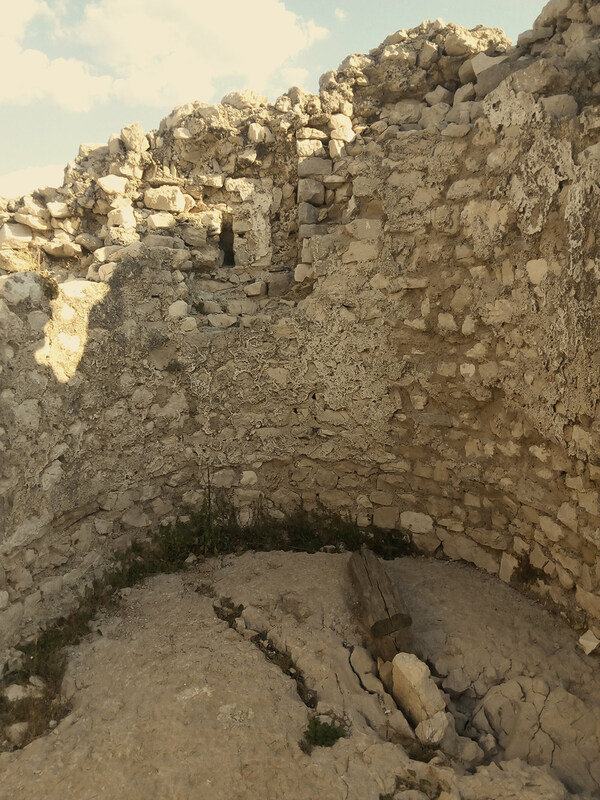 The ruins above the town are actually of a Roman fortress from Byzantine times that hosted a church dedicated to the patron of Pag: St. George (aha, the serpent slayer!). Perfect! I planned to do a little hike to Caska to check out the necropolis and some excavations and to do a small ritual inside the old church of St. George. I found it a bit confusing why there are not more remains of ancient Cissa itself if it was apparently such an important Roman outpost that gave the whole island its name. I found the answer in the same tourist guide (4): apparently the city had disappeared! Inspired by the multitude of archaeological finds along the coastline and in the shallow waters of the cove, legends about the dramatic sinking of the famous and rich city of Kisa were passed down orally in the Novalja area for centuries. The most frequently told story was about two sisters, the good sister Bona and the evil sister Mala, and about the angel sent by God to find one good human being among the evil, corrupt population of Kisa. The angel found Bona and ordered her to flee the city, which forever disappeared into the sea in a terrible earthquake as she fled. 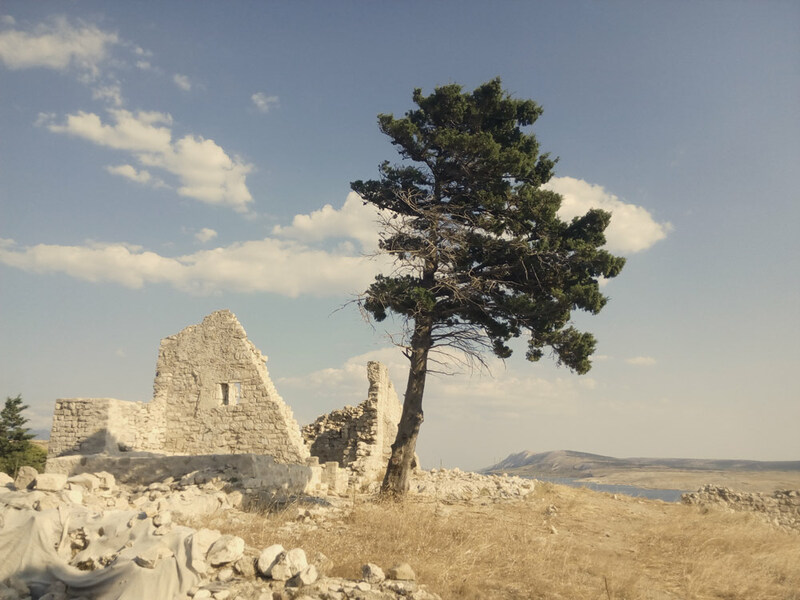 On Tuesday the 21st of August - my magic anniversary - I left Novalja around two in the afternoon and walked along the little road to Caska and up the hill to the Byzantine ruins. In contrast to my last year's self-initiation I wanted to keep it simple this time, but to honour my personal tradition of new beginnings happening on this island I also planned to try something new: shamanic journeying! ...it was my first attempt of consciously visiting the underworld and unfortunately it didn't really work out. I was in a deep meditative state where I couldn't feel my body anymore and all kinds of thoughts and ideas meandered through my consciousness but it wasn't a journey. But it was all fine, I didn't have any expectations. ...half an hour later I opened my eyes and right in front of my face was a shiny black giant cicada humming around a small purple flower that grew in one of the cracks of the ancient rocks. My first thought was "oh a scarab!". It was a beautiful moment. I walked down to Caska and along the rocky beach to a small watchtower that had been used by tuna-fishermen for centuries. I also found the remains of the "necropolis" which was a bit odd because it was right at the beach next to countless half-naked young people listening to loud music, getting sunburnt and sleeping off their hangovers from the hard party nights on this party island. I continued back to Novalja taking a small detour through one of the few beautiful pine forests. On the next day I felt a bit anxious and disappointed. Not only did my journeying attempt not really work out, but also the contrast between a rich and spiritual Roman past and today's hyper-mundane tourism-for-profit reality everywhere on the island left me a bit depressed. This did not feel like a proper anniversary at all! I needed to do something else! The moment this thought had formed in my head I knew immediately what my goal was: to find the altar to the local serpentine goddess Heia! I opened my laptop and connected to the awfully slow internet the tourist apartment provided and went through my sources again: what was this altar all about, who was this noblewoman Calpurnia and where in Cissa/Caska did she live? Very exciting! A haunted, decadent, Roman city that sunk after a haunted and probably decadent, Roman senatorial family had lived there! One interesting aspect of this specific altar is that it is dedicated to the local Liburnian goddess Heia (Eia, Heja, Eja) syncretized with the Roman women-only mystery cult goddess Bona Dea whose real name was secret but assumed to be Fauna, the shy and secretive wife of Faunus. It is intriguing because Faunus and Pan are tightly connected to the god Silvanus (also Dionysus/Sabazius) who was also prominently venerated throughout Illyria. Plus, Bona Dea is usually depicted with a serpent wrapped around her arm (Asclepius connection of healing) and surrounded by serpents. Her temples were known to have hosted numerous living serpents (5). It makes a lot of sense to see her as interpretatio Romana of a local Liburnian goddess Heia. 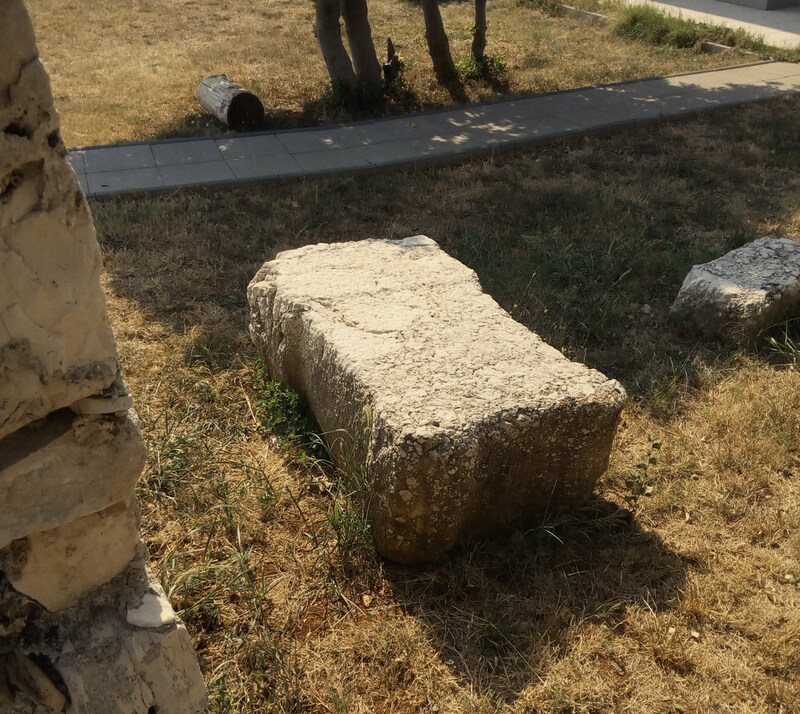 I went through several sources on Roman votive monuments and Liburnian deities that had lists of altars and other artifacts found along the Adriatic coast to find out more about the specific altar, especially about it's current location. 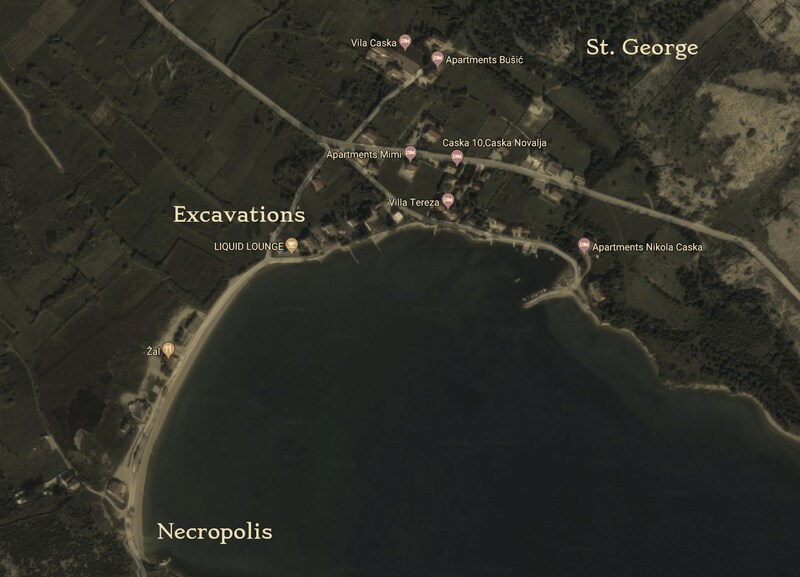 One Croatian list noted the altar was found in Caska/Gramače and is stored at the Stomorica collection in Novalja, another one (5) claimed that the altar was found in a "vinyard of doctor R. Palčič" in Caska and the tourist catalog (4) only said it was "found in Gramače", which is a completely different village than Caska. I concluded that it was probably not anymore where it was found, so most likely it must be at the aforementioned Stomorica collection, a small museum of Roman artefacts in the city center of Novalja. I went there straightaway. It was just a 10 minutes walk but closed when I arrived, so I went to the small cathedral instead and also took a look at some ancient mosaics around the corner. On the way back to my apartment I noticed the museum was open now (the church visit had paid off!). It was one room with shards of Roman pottery, some gravestones and rusty coins and pieces of different altars. I asked the lady at the entrance if she could tell me where I could find the "large Calpurnia altar" and she looked at me as if I had just ordered a Hamburger and fries. She did not know anything aside from selling tickets and postcards, so I left disappointed. Back home I sent an email to the museum asking for more information about the altar, without expecting to ever get an answer. Then I looked into my sources again. If it's not in the local museum, perhaps it is still where it was found? I spent a few hours scanning the satellite view of Google maps, comparing them to archeological sketches from other sources, and virtually driving along Google Street View, peeking into peoples virtual gardens. I started getting a bit obsessed about this mission (what Mars retrograde energies can do to an person with ascendant Mars and martian personal daimon!) Must. Find. It. The rock that can be seen on the photos looks a lot like the hand-drawn sketch and the photos also show an architectural structure right next to the rock, an L-shaped wall with a hole/window. In the background you can see the sea and some reddish roofs of modern houses. I took another tour across and over the island via Google maps, scanning for small L-shaped structures in close proximity to houses. After an hour of doing that I gave up. It was pointless. I went back to staring at the photos. I suddenly remembered the incredible crowdsourced forensics work of bellingcat and how they could locate objects from photos based on the background landscape. Let's try this again, Mars whispered into my ear. I looked at the photo backgrounds again, beyond the bushes and houses. I noticed the hillscape you can see beyond the sea. From Pag you can see the hills on the mainland on one side and a few more islands on the other side. Also it has long stretching coves and bays on the island itself, so it should be possible to find a place with this view. I jumped back into the virtual Google car and drove up to Gramače first, trying to find a spot where you can see the sea from the road. I looked south-west but aside from a small island on the horizon there was no such view in this direction. I looked down the other side towards the mainland. It looked a bit like on the photo but not really. The mountains were much higher. Then it suddenly struck me: The hill on the left side of the photo could actually be Sveti Vid, the highest mountain on the island of Pag which I had climbed for my initiation ritual last year and the lower bits on the right could be the beaches of Zrće! In that case it must be taken in or near Caska. I "drove" to Caska and peeked towards the sea. Yess, very possible!. The next day I walked to Caska again. The landscape from the photos was burned into my brain in all pixelated details so I was able to compare it in real-time walking the main road of Caska. I peeked up and down, left and right, trying to find hints of white rock walls near houses with similar roof-shapes as on the photos. I felt like Indiana Jones. Then I saw it! Down very close to the beach, behind a field of very dry looking vines. There was a wall that had a hole in it. I walked down towards it and noticed that it was located in a private garden next to a very modern looking house. It's too late now to respect properties, Mars whispered. So I jumped into it and there it was! A beautiful white limestone altar, exactly the shape of the one from the sketch! This felt right. This felt good. I was satisfied. Mission accomplished. Something clicked. It almost felt like a cycle was over, an open circle closed, or a spiral turned once. I still need to find out what this actually means. The first inhabited part of the island is the hill Košljun, close to Caska and on the way to ferry. There you could still found interesting parts of pottery, mosaics on the floor of what seems to be a small church, graves, remnants of the fortress wall and much more. Actually it is being explored as we speak. The archaeologists usually come before and after the tourist season and they are there right now. (1) Wilkes, John. The Illyrians. Wiley-Blackwell, 1995. (2) Matijašić, Robert. "The iconography of indigenous cults in northern Liburnia." Akti VIII. međunarodnog kolokvija o problemima rimskog provincijalnog umjetničkog stvaralaštva. Goledn Marketing, Tehnička knjiga, 2005. (3) Prusac, Marina. "Hybrid Deities in South Dalmatia." (5) Brouwer, Hendrik HJ. Bona Dea. Vol. 127. Brill, 1989.